I have tried to encapsulate the experience of arriving at KEGS in my post ‘From Comp to Grammar; Plantation to Rainforest’ . I firmly believe that the everyday experience for students at KEGS is far richer in terms of depth and challenge than that they would find in most schools. The purpose of sharing this view is not to peddle a narrow grammar vs comp argument, but to suggest that, beyond the constraints of daily school life, there is perhaps another level to reach, where it might be meaningful to talk of ‘learning without limits’. 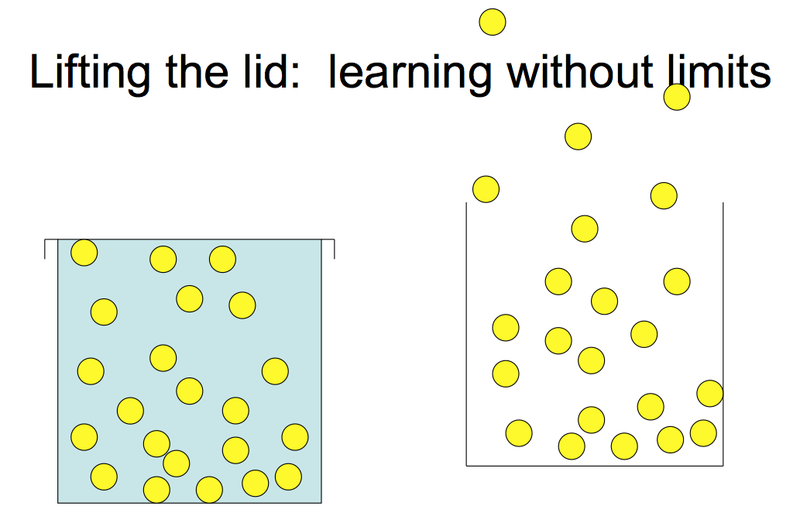 Students very often live life with the lid on….and I think KEGS shows what can happen when you take the lid off. In my experience, there are many inter-locking elements of the ‘rainforest’: student ability is only one aspect; it is the environment in which students use their abilities that matters more. The key elements are an embedded culture of high aspirations and expectations among staff and students; a passion for studying subjects in depth for their own sake; a recognition that school life should not be a choice between breadth and depth – it is possible to promote extensive extra-curricular activity and a strong focus on examinations; a belief in student leadership – of the school itself and in terms of learning; a conviction that independent learning is key but needs to be developed and a confidence that ‘deep-end’ learning ultimately leads to great success for the majority. This is THE highlight of the year at KEGS (read more in a dedicated blog): four 25 minute programmes of music, one from each House, performed in front of the whole school and judged. It is the competition they all want to win. Each programme comprises five acts: a choir, a solo piece, a rock band and two others with students from each Key Stage involved. The comperes for each house provide an added comedy element. The standard is phenomenally high with 50- strong choirs, string quartets, bands and a range of talented singers and instrumentalists. However, what makes it special is that it is completely student-run. Within the houses, they run auditions, select performers and organise rehearsals. On the day, we just turn up and watch. It is fabulous. Leading up to House Music, there is a frenzy of rehearsal activity: to find 50 students of all ages singing in four-part harmony in the playground during break, conducted by a Sixth Former with no teacher present, is really quite something. A few weeks ago, looking for a colleague, I stumbled upon a room with 20 lower school students in it. They were in the middle of a debate: ‘This House Would Invade North Korea’. The Chair was a Year 9 student and the whole business was being conducted with total order and sincerity and the level of debate was superb. The teacher running the debating group had left them to it. I have been back since – this happens on a regular basis. Most recently, they were debating the value of Drama in the curriculum! Languages are big at KEGS. Lower school students study one language for four hours a week and take GCSE in Year 9. This accelerated and intensive approach is in its early stages but the signs are promising. However, this stems from a wider culture where language learning is highly valued. In my first year at KEGS I was astonished to encounter a Sixth Form German class waiting to enter the room where the students were chatting in German – making jokes and playing word games. This was normal for them. German Banter! Some of these students, later that year, gave musical performances at a concert; the pieces were introduced in the language of the composers. On a lesson-walk about, I’d taken an interest in a students’ art work. He said he’d like me to see another piece. Some days later, he saw me in the playground, ran off to get the work and brought it to a picnic table. It was just meant to be for my eyes but soon enough we had a gathering; what followed was a lovely supportive peer appraisal of the work. I’d never seen boys so willing to share their thoughts and feelings about art in this open way – in a public place. Lovely. One of the best lessons I’ve ever seen. The students had been asked to read Dr Faustus by Christopher Marlowe (given about 2 weeks) and, as a preliminary activity for homework had been tasked to work in pairs to produce a large A1 sheet with a visual representation of the key themes in the play. The plan was for them to give a short overview of their work prior to further teacher input. However, what happened was remarkable. The students’ work was sensational – some had produced time-lines with a good-evil axis; some had produced conventional mind-maps and others more organic flow charts. They took turns to explain their thinking and then to ask each other questions. It was like watching a 2nd year university tutorial where the tutor had left the students to themselves. The teacher simply ensured that each person had a voice – the content was all theirs. She ripped up her lesson plan…. the range of themes and concepts they were able to bring into the lesson was astounding…. the culmination of the teaching process that underpins our Sixth Form English course, but that starts way back in Year 7. This deserves its very own blog – see here. Project 9 is a student-run IT programme where students in Year 9 engage in a series of workshops run by older students. We do not have formal IT lessons beyond Year 8 so this is, in effect, their IT curriculum and we run it in place of other lessons on several days in the year. The student leaders interview and select a team of IT teachers who then plan and deliver workshops that match the choices Year 9 students have made; they use our VLE to make their selections. The range of options includes programming with various languages, pc building, stop-frame animation, making podcasts, using flash and photoshop and a range of other applications. The final session is a ‘showcase’ where the students show each other their work. The whole operation is run by a team of Y13 students. In Year 7, we ask all parents to take their son to the British Museum at the weekend or at half-term, before January. It is free – and they are grateful because often they have never been before themselves. 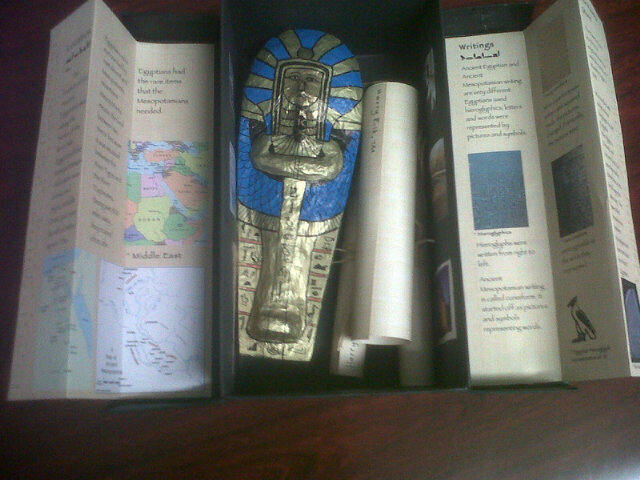 The aim is to research ancient religions from Egypt or Mesopotamia. The students have to produce a ‘response’ – that is just about all the guidance we give; it is open-ended. Last year the responses were amazing; a 10 minute video with a witty commentary, a shoe-box turned into a tomb with mummy and scrolls inside full of wonderful writing, and a website with a fabulous interview with the child’s parent describing her experience. Our student newspaper is now 100% student run, without censorship, supervision or editorial interference. This has emerged over time but, now, there is a level of trust that makes this work. See the dedicated blog here: Independent Newspaper? Trust and Responsibility. Six issues are produced a year and if you follow @KEGS_Ambassador on twitter, you can gain access to the whole back catalogue. The Ahead of the Times feature is reproduced in this blog. The student team have developed the communication systems needed to reach the whole school and the quality of writing is excellent. See for yourself. The co-construction process that we are developing at KEGS is documented here. One spectacular example was the Year 7 group that developed websites ‘Embracing Christianity’ and ‘Embracing Islam’ as a vehicle for leading the learning in their RE class. As well as providing useful information, they embedded the homework assignments that they set for the rest of the class into the website. The teacher did not show them how to do any of it – in fact, he didn’t know how. During a rainy lunch hour, I hear the noise of animated chatter from Room 3 and Room 2. Inside each room there are 10 – 15 pairs of students engaged in intense discussions over exam papers. One of each pair is Year 11 History GCSE student; the other is a Year 12 student with an A/A* GCSE in History under their belt. The proximity in age gives them a relaxed confidence in discussing approaches to questions and both parties benefit enormously. The teacher….. well I think he was hovering around somewhere. In May, a group of Year 13 students put on a fabulous production of the Tom Stoppard play – just weeks before their exams. They had the idea, put the cast together, directed it and – it happened. They just wanted to do it and had nothing to prevent them going ahead. Initially it was intended to be an outdoor production but, with rain playing havoc, they moved it inside. They hired period costumes to give it real polish and, with ticket sales, it nearly broke even. Assemblies are the key to transmitting our values, our ethos and the culture of learning that permeates the school. Five times a fortnight, 900 students cram into the hall for assembly; Sixth Form on the balcony and stage, Year 7 to 9 sitting on the floor and Year 10 and 11 on the banked seating. Packed to the rafters. 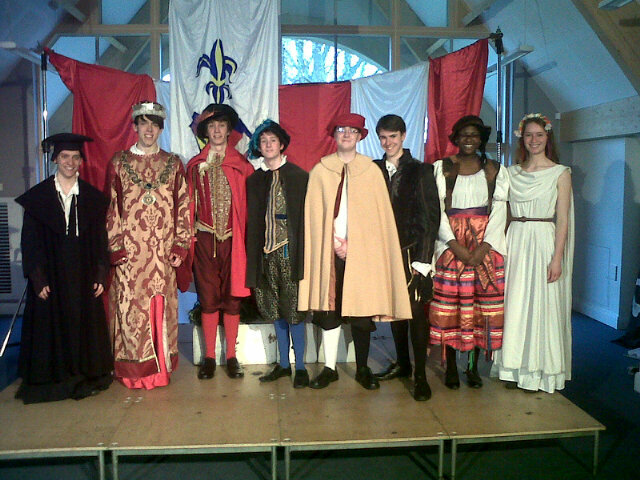 Head and Deputies wear gowns… it is all part of the theatre. (A student lobby demanded the reinstatement of gowns after my early reluctance to wear one. A modernisation too far!) 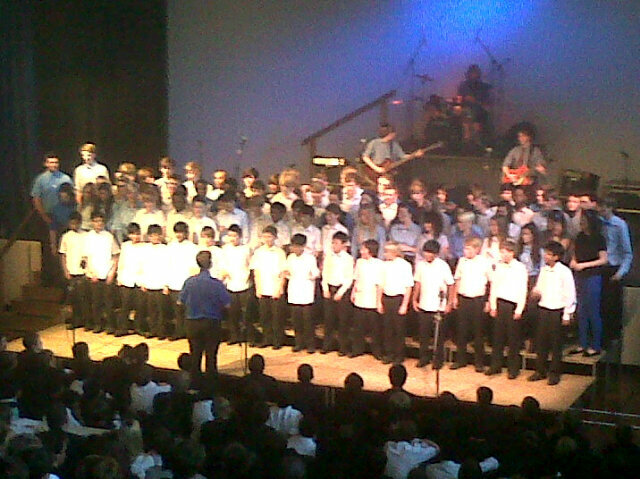 We celebrate achievements and invite students to voice opinions; we mark the school’s traditions (singing Jerusalem at Easter is the students’ favourite); the youngest students sit in awe of the sophistication of the senior students as they walk to the stage to speak or receive awards; they aspire to be like them – it has a powerful effect. The younger students also receive the approving applause of the school when they too receive awards. This is hugely motivating. The school would not be the same without these assemblies. If the hall was too small I’d advocate dividing the school into two halves so we created the same vertical effect – it is the modelling from Y13 down to Y7 that keeps the ethos strong. So, there you go. Some samples from life at KEGS. As you would expect, I often have to take a view on selective education. My response is to suggest that if activities such as the ones I have described were routinely experienced by able students in every school, there would be no demand for KEGS. If we closed KEGS down – would these things start happening elsewhere, or would they start to disappear? It is a genuine question. Clearly, a critical number of able students oils the wheels of these events – but actually the confidence and trust that underpin them need to come from the school. Is there not a role for selective schools to guarantee that these opportunities exist – and to show what is possible, when the conditions allow and learning has the lid taken off?